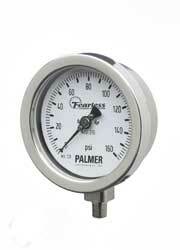 Palmer Fearless Gauges offer Filled Gauge performance without the disadvantages of Liquid Filled. Vibration and Pulsation Resistant Readings similar to a Liquid Filled Gauge. In Situ Calibration using micro adjustable gear drive pointer. 1/4 turn Bayonet lock removable Bezel Ring. CASE: AISI 304 Stainless Steel Solid Front 4” (100mm) diameter watertight case. FILL: Dry, Wet is optional. RING: AISI 304 Stainless Steel Bayonet Bezel Ring. SOCKET: AISI 316 Stainless Steel Socket and Tube, Argon welded. CONNECTION: 40SF - 1/2” NPT standard, 1/4” NPT built available upon request, or with 1/2” to 1/4” SS adaptor. ACCURACY: AISI 316 Stainless Steel. MOVEMENT: AISI Stainless Steel special Dampened Movement with wear-resistant, self-lubricating gears. POINTER: Balanced black Aluminum, micrometer adjustable. DIAL: White Aluminum with black markings in accordance with ASME B40.1 - 2005. RANGE AVAILABILITY: See Product Specifications *Non-Stock Ranges may require a 5 piece minimum per Range. PROCESS TEMPERATURE LIMITS: -4° to 176°F(-20° to 80°C). AMBIENT TEMPERATURE LIMITS: -40° to 248°F (-40° to 120°C). OVERPRESSURE LIMITS: 20% of full scale value. Call 1-800-421-2853 or e-mail us for specific availability. Contact Us about making it a Custom Dial if available. For further information, see the related Technical Information menu to the left.